Why should my cafe serve Matcha? We have clearly seen in the last 5 years, and especially within the last 2, a massive increase in people’s interest towards Matcha Green tea all over the world, with a strong established presence in Asian countries such as Japan, Singapore, Hong Kong leading the way and followed by a huge increase within western countries such as Australia, USA and Europe, which are right in middle of this huge spike. Given the familiarity with Matcha that the majority of Asian population has, and given the strong presence of the Asian culture within Australia, I believe that introducing the product would attract a broader target of new customers allowing for it to spread faster. I also believe that as a consequence of the shift that is happening all around the world, which is raising people’s awareness about the importance of a more balanced diet filled with nutrient rich foods and an overall healthy lifestyle, Matcha has fallen right into this collective need by offering outstanding levels of powerful Antioxidants which fight oxidative stress and increase energy levels, as well as gifting our eyes with its natural bright green color that directly connects us to Nature. Matcha can be a great energizing option to offer next to coffee drinks, giving to customers the opportunity to enjoy a new delicious and healthy drink as well as satisfying the request of those looking to alternate or limit their coffee intake. I believe that Matcha will soon become an established component of a big part of population’s life, and a lot of people will be expecting to find Matcha drinks at cafes too, which is indeed already happening. Just like Chai for example, which in the beginning was an alternative drink that only a few cafes started offering, over time became a must for all cafes in order to satisfy the constant and increasing demand for quality Chai. Another brilliant component of Matcha that could benefit every café is the fact that it offers an extreme versatility in the kitchen! It can be mixed into smoothies, breakfast bowls and used for baking purposes, offering a level of flexibility in the preparation of cakes and desserts that can be easily compared to the one of chocolate (cacao). The amount of cafes that are offering Matcha is rapidly growing around all Australia’s main cities with Melbourne and Sydney leading in front of Perth, Brisbane and Adelaide. Melbourne, Sydney and Perth have all witnessed within the last 2 years the opening of actual Matcha Cafes, which specialize in offering specialty Matcha served in many different ways, from the simplicity of a cup of tea (hot or iced) as well as Matcha Latte and Matcha based desserts. 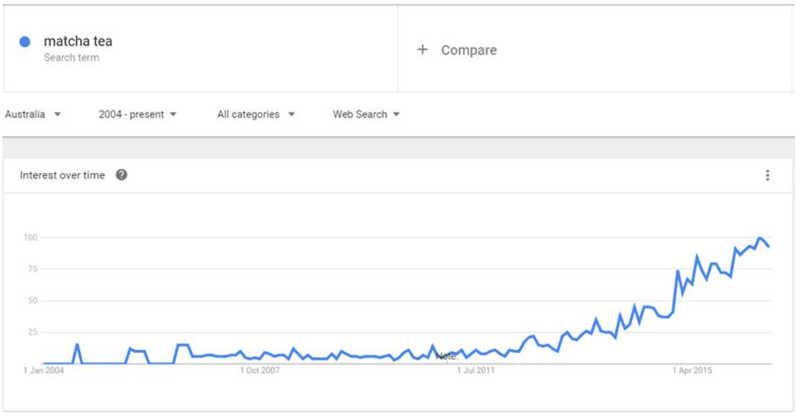 Here below we are sharing a graphic source from Google Trends that shows the clear spike in people’s online search about Matcha since 2004, which is trending in a massive way that doesn’t look like slowing down. Implementing Matcha into your cafe's workflow. My cafe is so busy, will this slow me down? Just like brewing specialty coffee and many other drinks, we find that by following a few simple rules for its preparation, any café would be able to serve a quality Matcha in a very practical way that won’t slow down the workflow. In order to assist busy cafes we have developed an easy recipe, which can be prepared daily and allows to pre-mix a day worth of drinks in only 5-10 minutes, based on each cafe's need.